How often do members of this WONDERFUL SPECIAL NEEDS POPULATION have the opportunity to GO SOMEWHERE, after school or work, where they can be as COOL AS THEY WANT, or as GOOFY AS THEY WANT, and still be COMPLETELY ACCEPTED? It is 3:00. The door chimes and members start to come in. As they find a place for their things and grab a snack, we see them begin to congregate at our big table. We start to hear them ask about each other&apos;s day. We know when someone new comes in by the chorus of "Hello! Hey!" Everywhere you look, there is something going on. Members are updating the chalk wall, some are going over the menu for dinner, and others are watching TV together, playing games, or enjoying downtime. If it is Thursday, they may have already started karaoke. They are all members of The Social Scene, A Club for Adults with Special Needs. SOCIAL NETWORK: Every activity that takes place at the Social Scene has a learning or live example aspect to it. The space itself lends a hand to our learning component, simply by allowing us to have a group of adults together in a common area. 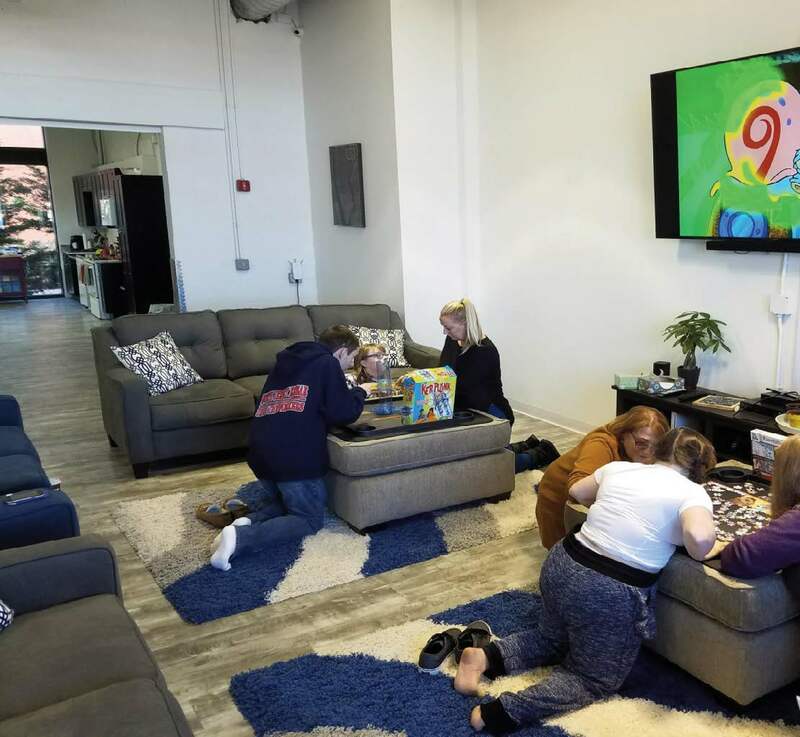 Founded in February of 2016, The Social Scene Club has become the newest game in town for social opportunities for adults with special needs. Unique in our philosophy of care, the club is considered a one-of-a-kind social experience, where adult members are empowered to make social and life choices in a safe, supportive environment. While we serve different purposes for different individuals, the common core themes remain the same for all of our members; occasions to make friends, the chance to hang out and be an adult with age appropriate peers. It is a place to go where you can truly be yourself, for we offer a judgment-free zone. How often do members of this wonderful special needs population have the opportunity to go somewhere, after school or work, where they can be as cool as they want, or as goofy as they want, and still be completely accepted? Although The Social Scene Club has only been open for a little under a year, the story really began15 years ago with club founders and sisters Melissa Howard and Lauren Turiello. We were still living at home with our family when a little eightyear-old girl named Nikki, who has Down syndrome, needed someone to watch her after school. Melissa, a full time special education teacher, was approached by Nikki&apos;s mother to see if should could be with her while her parents worked. Young and still living at home, we watched over Nikki at our home where she instantly became an extended member of our family. Since then, we have had the distinct pleasure of watching Nikki grow up. Nikki served as an inspiration for us, and we began to become heavily involved in volunteering with special needs children. We also started to notice the opportunities that weren&apos;t available and began to create them with Nikki in mind. We even coached a special needs cheerleading squad for a time. Soon after we founded a special needs dance program. As that evolved, our dancers matured and grew up. We noticed that they had so much fun interacting and "hanging out" at dance class, but chances to do so outside of the studio were limited. In response, we started hosting social outings once a month. It was an opportunity for our dancers to get together socially, without Mom and Dad around, and have fun. They really looked forward to the outings, and we saw how positively they responded to independence, empowerment, and everyday fun. Even in those early outings, the framework for The Social Scene Club was present—create opportunities that serve the individual first, give them the chance to practice and apply daily living skills in an actual environment, blend learning and reinforcement with fun. As Nikki became older, we also started to see that she wanted to do the "typical" things we did as young adults; go out to dinner with friends, get her nails done with friends, watch movies with friends, work out with friends, etc. It was hard, at times, for her to get together with a group of friends, and we could not help but wonder if there were other young adults experiencing the same thing. After many discussions—when Melissa decided to continue teaching full time, and Lauren retired from the Public Sector—we finally decided to create a place for Nikki and her friends. A place that has everything adults like to do, in one cool supervised space. A place to eat dinner together, watch a movie, work out, make friends, be creative, and be yourself. 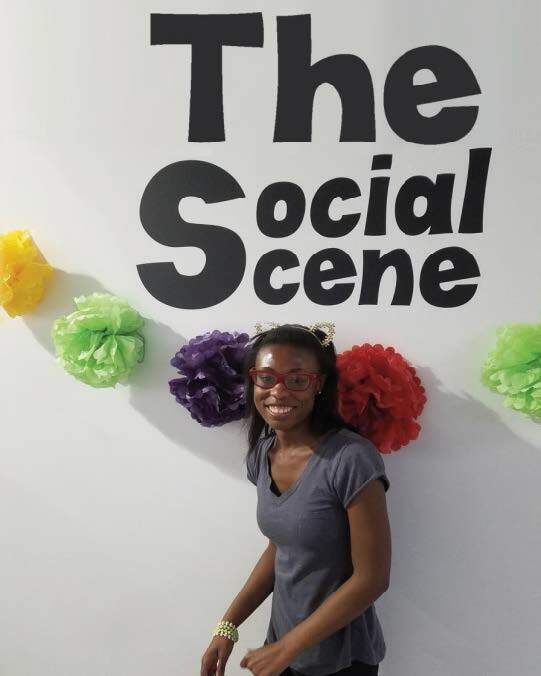 The Social Scene Club was born, and as a nod to our muse, we used her beautiful face as part of our logo. We are social club for special needs adults, open Monday through Friday from 3:00 to 8:00 pm in Lyndhurst, New Jersey. Our Club space is over 2,100 sq. ft. and includes a reception area, dining area, crafting space, health and wellness corner, book nook, a lounge, two bathrooms, and a full kitchen. We are located in a ground floor accessible, commercial space, in a residential condo minium, with access to a river walk, nearby dining and entertainment, laundry facilities, and a courtyard which is home to our accessible garden. Our back door is within 30 feet of the Access Link drop off. When choosing the right space, we knew we needed to be near the action, with access to options outside of The Club to engage our members. We offer drop-in hours, daily, weekly, and monthly memberships. We also offer Social Hours, or day hours, during certain school and program closings. The Social Scene – A Club for Adults with Special Needs is a membership based, private pay, late day, early evening, social environment. The Social Scene is a place where members can socialize, exercise and reinforce the skills they learn daily, providing a natural, safe and comfortable environment for our members to be themselves with their friends and peers. 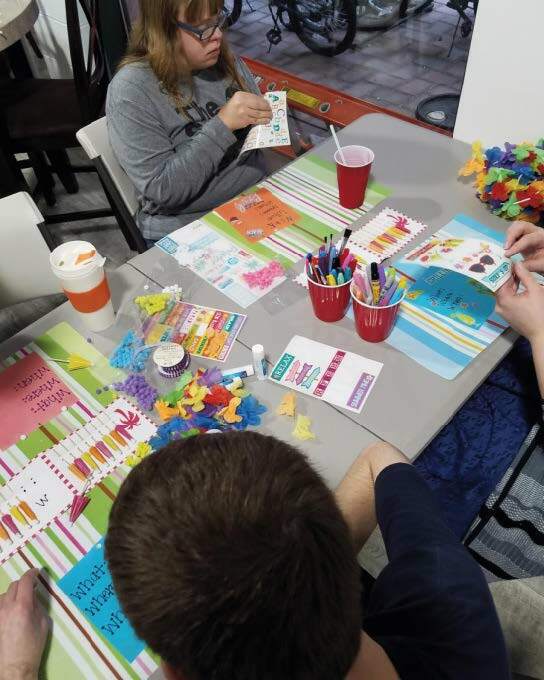 BUSY HANDS: The club strives to create opportunities that give individuals the chance to practice and apply daily living skills and to blend learning and reinforcement with fun. The purpose of The Club is to give members opportunities to socialize, have meaningful relationships, and apply the life skills they are learning during the day and utilize them in a real-life setting. Every activity we do has a learning or live example aspect to it. The space itself lends a hand to our learning component, simply by allowing us to have a group of adults together in a common area. As with any group, there are different dynamics, instances of conflict resolution, the need to share, step up, step back etc. Our members have the added benefit of our passionate, experienced staff, to help guide them through these social interactions. The best way to describe the staff and our involvement is to think of us as lifeguards, always keeping vigilant eye on what&apos;s going on, and jumping in if there is a situation. Our eye in the sky approach allows members to feel independent, families to feel comfortable, and staff, the view of our individuals and their reactions/interactions in social settings. This information affords us the opportunity to tweak an activity or occasion to better suit our members&apos; needs. We also cook dinner together every night at the Club. In the beginning, the staff set the menu with some input from members. Now, the members are setting the menu, with some input from staff. Every now and then someone will want surf and turf, or sushi, or something wild for dinner that we have to let them know just won&apos;t work. For the most part though, they have some pretty great suggestions and favorite dishes. SEE AND BE SCENE: the Social Scene and its members have a strong sense of community, and take pride in our ability to give back, get out there, and get involved. As with our activities, we also follow a theme with our dinners. Monday is our Meatless Monday, which is a great way to expose members to foods other than chicken and beef. Tuesday is Taco Tuesday. Always a crowd pleaser, Latin-inspired cuisine takes center stage. Think quesadillas, empanadas, burritos, taco salads, etc. Wednesday is our Pasta Night. There are endless options, and healthy ways to enjoy this night. Thursday is our Meat and Potatoes Night. The broad category paved the way for some signature club favorites like shepherd&apos;s pie and air fried chicken fingers. Finally Friday, is our Pizza Night. The variety and input from our members really allow for some of them to become more adventurous or willing to try something new. Members are always welcome to bring their own food and are still encouraged to participate in meal prep if they are interested. The simple act of cooking and eating together are great platforms for us to work with members on portion control, consideration of others, manners, and how to have appropriate fun and be social at meals. As proud as we are of the wonderful things we get to do inside The Social Scene Club, we are equally as proud of the things we do outside of The Club. We have a strong sense of community, and take pride in our ability to give back, get out there, and get involved. Once a month we have Supper Club, where members support local small businesses by dining out with their friends. We also do community service through a local non-profit Visiting Homemakers of Bergen County. Twice a month we food shop for a senior citizen in town and deliver her groceries. We love this project for some many reasons, but the main ones are: members get to food shop and learn to follow a grocery list, they are able to fine-tune their social skills and financial literacy and, most important, they get to be the ones to do the community service, rather than being on the receiving end of someone else&apos;s community service. We have also supported other area nonprofits, with teams at their walks, and participation at their events. In the end, it is the impact The Social Scene Club has on our members that fulfills and inspires us to keep being creative and committed to providing this vital social outlet. To see members work up to cooking an entire dinner from start to finish, independently, is an almost indescribable feeling. It is also wonderful to that know the birthday parties we threw for some of our members were the first-ever in their lifetime where they celebrated with just friends. We love to hear from families that they are seeing a positive change at home from our members. It is what we work for! ABOUT THE AUTHORS: Melissa Howard, CEO, is a licensed special education teacher, with over 15 years of experience. She specializes in independent living skills and socialization. In addition, Melissa has over 13 years of volunteer experience engaging children and adults with special needs. Melissa and Lauren have co-founded a successful non-profit corporation We Heart, Inc., whose mission is to provide creative and social outlets to children and adults with special needs. For almost half a decade, We Heart members have enjoyed dance and movement classes, social outings, performance opportunities in the community and showcases. Lauren Turiello, President, has previously worked as an executive at a health and human service agency providing services to adults with developmental disabilities. In addition to her administrative knowledge and professional expertise, Lauren has over 11 years volunteer experience with both children and adults with pecial needs.